Who says a centre-console can’t make a practical bay boat? The Haines Hunter Prowler series certainly shows you can. Boat writer Jack Murphy's Haines Hunter 525 Prowler. This fishing boat saw an incredible amount of action, having travelled and fished everywhere from Melbourne to Far North Queensland. Whilst centre-consoles were once only found in our warmer northern climes, the rise in the popularity of lure casting has now bred a market for these dedicated sportfishing boats like this one right around Australia. 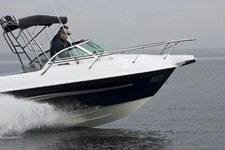 The Haines Hunter 525 Prowler is easily powered by a 90hp outboard motor and with that in place it competes well above its class. Power her up to its maximum 130hp and you certainly won’t be "prowling". This is a hull that will take you to sea or to estuaries, impoundments and their tributaries, and it’s a wonderful example of modern sportfishing technology. 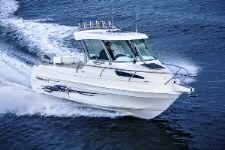 While essentially a fishing boat for two, it still cruises comfortably and securely with five people onboard. The expansive console houses a massive storage bin with a padded lid and backrest, as well as a beautifully moulded helm fitted with modern instrumentation.